A memoir in which Harvard professor and author Allen illuminates the path that led to her cousin Michael’s incarceration at age 15 and to his murder at 29, less than a year after his release. Innovative in style and structure, Cuz is nonetheless part of a tradition of moral reckoning expressed in black American nonfiction. It brings to mind its literary cousins: Jesmyn Ward’s memoir Men We Reaped, Bryan Stevenson’s Just Mercy: A Story of Justice and Redemption and Michelle Alexander’s The New Jim Crow. Like those three books, Cuz seems to draw its inspiration from James Baldwin’s lament that black progress in the United States has been at best superficial. 'Morally,' Baldwin wrote in 1984, 'there has been no change at all and a moral change is the only real one.' Through Michael’s tragedy, Cuz draws a portrait of the moral failings in America that are responsible for too many of our cousins’ troubled lives and early deaths ... Cuz is a literary miracle of form and content. The book pleads with us to find the moral imagination to break the American pattern of racial abuse. Allen’s ambitious, breathtaking book challenges the moral composition of the world it inhabits by telling all who listen: I loved my cousin and he loved me, and I know he’d be alive if you loved him, too. ...a compassionate retelling of an abjectly tragic story ... Among the most valuable contributions Allen makes is forcing us to ask: To what end are we locking up our children? Are we not foreclosing their options before their lives have even begun? ... If Cuz were blighted by one or two unsightly clauses, I could have overlooked them. But there are many, and each jolted me out of my reading rhythm, as if a moth had landed on the page. She often has trouble conveying her emotions, too ... Allen’s analysis of gang culture — or 'the parastate,' as she calls it, with its own bylaws and tragic form of appeal — may be where she’s at her ferocious best. She points out that however strong the state is, the parastate is stronger — violate its rules, and you’re asking for death. 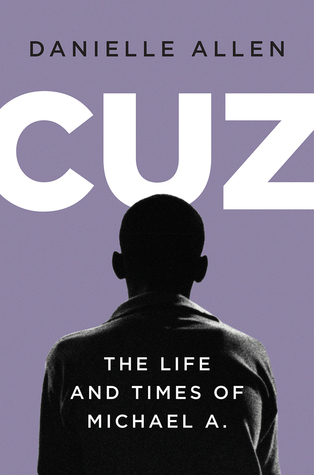 In Cuz: The Life and Times of Michael A., Danielle Allen, a decorated scholar and Harvard professor, struggles with the short life and violent death of Michael Alexander Allen, a first cousin ... Her description of her prison visits is perhaps the most riveting chapter in the book, bringing to mind Wideman’s excursions behind bars to talk with his brother Robby ... Both observations, rendered in quite different but strikingly forceful language, provide a telling glimpse of the dehumanization (both subtle and overt) that can accompany the death of a black person, often while the body is still warm ... Readers will finish this brief, perceptive memoir knowing just enough about Michael to appreciate the author’s devastating sense of loss. They will also have an understanding, barring changes to the system, of the many more Michaels we stand to lose. What did you think of Cuz: The Life and Times of Michael A.?